70 to 90 percent of people living in nursing homes have hearing loss, but 81 percent of them don't receive any hearing health care. Here are some things you can do to help your loved ones in nursing homes to hear, and live, easier. ​While over 70 percent of nursing home residents in the United States have hearing loss, only 10 percent had taken a hearing test in the previous year. A study published in the Journal of American Medical Directors Association found that of the 279 nursing home residents they studied, only 30 had had a hearing loss screening within the past year. These results are thought to be typical of nursing homes across the US. These results serve as a reminder for those people with loved ones in a nursing home: it will be up to you to ensure that their hearing health is taken care of. Being able to hear what is going on around you is essential for a good quality of life, particularly in a nursing home with few solitary activities available and other residents around constantly. For residents who have cognitive or emotional impairments, hearing loss can lead to even more anger, anxiety and confusion. Hearing loss also exacerbates the symptoms of Alzheimer’s disease, so any resident with a cognitive impairment should have regular hearing screenings. For these residents, the use of ​hearing aids must be a priority. 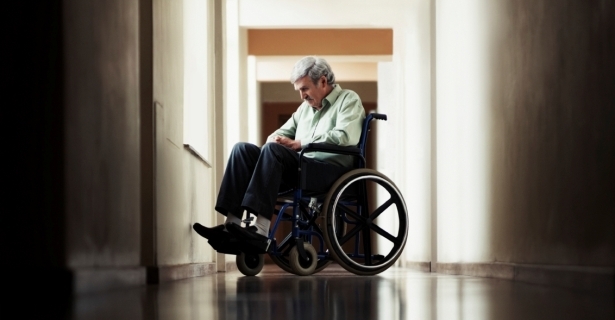 The researchers found that nursing home residents who had hearing aids often didn’t use them. Hearing aids do require some care and maintenance, and it can be more work than a nursing home resident can manage on their own. At the same time, caregivers in nursing homes may not be available to help when needed, and ultimately the hearing aids often end up sitting unused in a box. With regular hearing check-ups with an ​audiologist, many of these issues would get resolved. Label the hearing aids: If they are lost, hearing aids are difficult and expensive to replace. Writing your loved one’s name in permanent ink will make the hearing aid easy to return if it is found. Painting hearing aids a bright color make them easy to see if they fall out. Store them safely: Any small plastic case or box beside the bed is a good place to keep hearing aids overnight, so they are easy to find the next morning. Clip them on: There are various cord and clip systems on the market that clip to the hearing aid, and to the wearer’s clothes. If they fall out of the resident’s ears, they won’t be lost, or crushed underfoot. Maintenance: Lend a hand to help with the general ​maintenance of your loved one’s hearing aids. Clean the devices at least once a week to remove debris, and at the same time, check the batteries to see if they need to be changed. Communicate with the staff: The most important thing you can do for your love done is to develop a good relationship with the staff at the nursing home. Keep the lines of communication open, and learn about the policies of the facility when it comes to hearing aids and hearing care so your loved one’s hearing can be adequately care for. Regular use of functioning hearing aids can go a long way towards improving the quality of life for a loved one in a nursing home. Help them navigate the way, and make sure that your loved one remains part of the conversation.